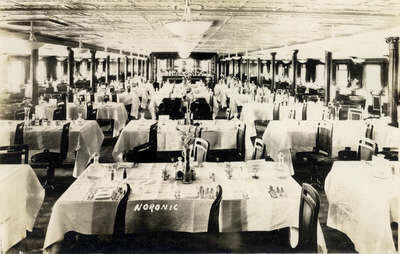 One of the biggest and most decadent of them all was the SS Noronic. 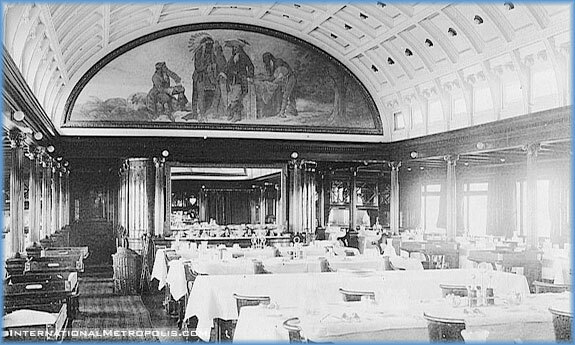 "The Queen of the Lakes" had a ballroom, a dining hall, a barber shop and a beauty salon, music rooms and writing rooms, a library, a playroom for children, even her own newspaper printed on board for the passengers. But as fancy as it all was, taking a cruise was also darned risky in those days. Ships sank; they capsized or collided with each other. Many, like one of the Noronic's sister ship, the Hamonic, burst into flame. Even the Noronic's own maiden voyage had almost been a disaster. The ship was scheduled to set sail for the first time in November of 1913, just as the biggest storm in the history of the Great Lakes struck. For three straight days, it lashed the region with hurricane-force winds, 15 meter-high waves and torrents of rain and snow. More than 250 people died and so many ships were destroyed that there's an entire Wikipedia page dedicated to listing them. The Noronic, though, was lucky. She stayed in port and avoided the storm. That was the beginning of 36 years' worth of safe sailing, right up until September of 1949 when she left Detroit for a week-long cruise to the Thousand Islands. It was that trip that brought the Noronic to Toronto on a cool Friday night, docked at Pier 9—at the foot of Yonge Street—while her passengers and crew streamed ashore to enjoy the city. 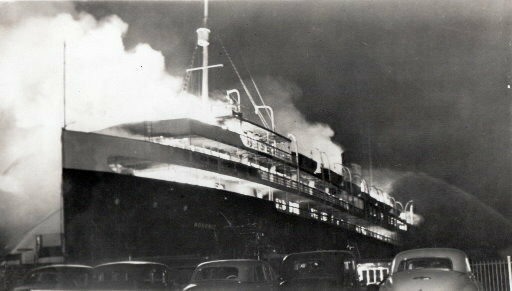 Sadly, by 2:30 am, when the fire started, most of them were back on board, asleep in bed. The smoke was first spotted by a passenger who tracked the source back to a locked linen closet. And by the time he alerted one of the ship's stewards, it was already too late. When they opened the door, the fire spread. And when they tried to put it out with a fire hose, the hose didn't work. Neither did any of the others. 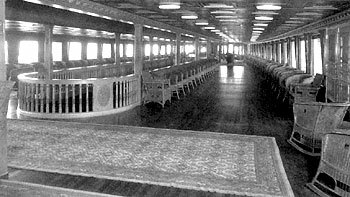 Even worse, the ship's hallways were lined with gorgeous wood paneling, which, for decades, had been carefully polished with lemon oil. It was the perfect fuel for the fire. Meanwhile, stairwells acted like chimneys, funneling oxygen to the flames. They spread. Fast. Eight minutes later, when the ship's whistle jammed while issuing a distress signal and let loose with one piercing, endless shriek, half the ship was already on fire. Within minutes, the rest of the Noronic would be in flames too. Survivors later said the whole thing went up like the head of a match. On board, there was chaos and panic. The safety equipment didn't work. There weren't enough emergency exits. Only a few crew members were on duty and most of them had fled the ship immediately, leaving the sleeping passengers behind. People were burned alive in their beds. They were suffocated in their rooms. They rushed along the decks and hallways in flames. A few were trampled to death. The most desperate started jumping from the ship, the lucky ones hitting the water, where rescuers—police and firemen and passers-by—were pulling people from the lake. One drowned. Some hit the pier and were killed. And when the first ladder was finally hoisted up against the ship, passengers pushed forward so eagerly that it snapped, tossing people into the water. As Wikipedia puts it, "The screams of the dying were said to overpower even the sounds of whistles and sirens." It was one of the most horrifying scenes Toronto has ever witnessed. The blaze finally died out around five in the morning and two hours later the Noronic had cooled off enough for people to start reclaiming bodies. They were everywhere: skeletons found embracing in the hallways, others still in bed, some turned entirely to ash by a heat so intense it could incinerate bone. At first the dead were pulled from the wreckage and piled up on the pier, but eventually the Horticultural Building at the Ex was turned into a makeshift morgue. For weeks, authorities struggled to identify the bodies. It was next to impossible. No one even knew how many people had been on the ship. Some were guests from Toronto visiting friends on board. Others, taking romantic cruises with people who weren't their husbands or wives, had registered under false names. And lots of the bodies were so badly burnt that entirely new techniques of x-ray identification had to be developed. Eventually, the final death toll was pegged at 119 lives. It's the most people ever killed by a disaster in Toronto's history. In the wake of the fire, it didn't take long for the safety laws to be overhauled. And that, in turn, meant the end of luxury liners on the Great Lakes. It was just too expensive to run them if they weren't allowed to burst into flames every once in a while. There are lots of amazing photos of the Noronic. There are shots of what the interior looked liked before the fire here and here. Here's the dining room before and after. 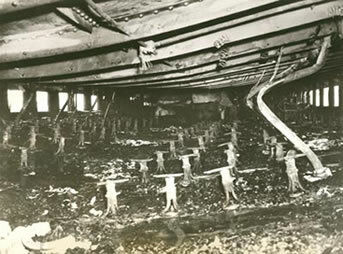 And a bunch from the Cleveland Plain Dealer: of firemen fighting the fire here, the charred wreckage here and a diver searching for bodies in the ship's lower decks here. Also, the Horticultural Building's temporary morgue is here. There are neat photos of that big 1913 storm, too: a big wave in Detroit here, a streetcar snowed under in Cleveland here, more snowy Cleveland here and here, and bodies washing up in Goderich here. You can read more about the Noronic disaster in a couple of interesting articles from the Walkerville Times and the Cleveland Plain Dealer. And there's a ten minute CBC Radio segment in their archives, looking back on the disaster from 1977. There's a memorial to the victims in Mount Pleasant Cemetery and a plaque erected near where it happened, which is now right by the spot where the island ferry docks. You can also see the ship's whistle on display at the Marine Museum on the waterfront near Ontario Place.